Phonolite: Mineral information, data and localities. Phonolitic rocks, with felsics comprising 10-60% foids and alkali feldspar/total feldspar >0.9. The extrusive or fine grained equivalent of nepheline syenite. 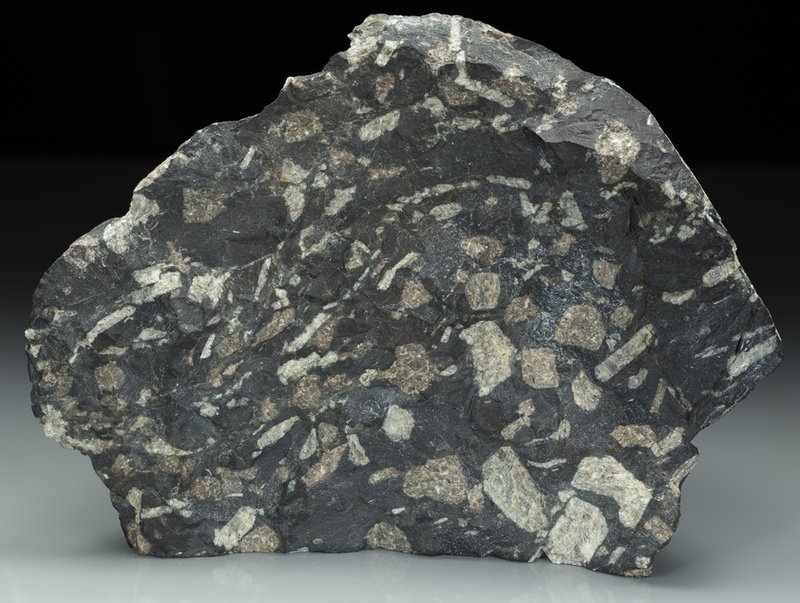 The principal mineral is anorthoclase or sanidine. 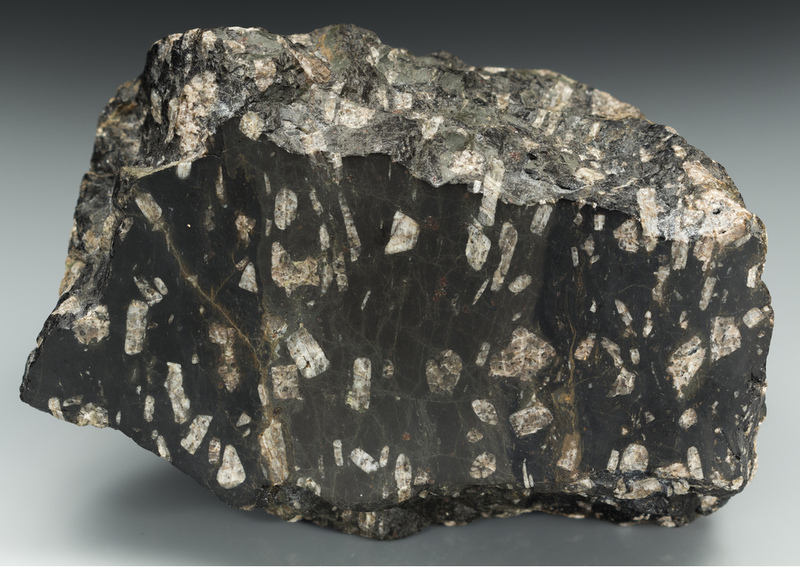 Other major minerals may be nepheline, aegirine and diopside, usually with other feldspathoidal minerals such as sodalite or hauyne. Accessories include apatite and sphene. [Tinguaite] Gilligan, L.B., Brownlow, J.W., Cameron, R.G., Henley, H.F. (1992) Metallogenic Study and Mineral Deposit Data Sheets: Dorrigo-Coffs Harbour 1:250 000 Metallogenic Map SH/56-10, SH/56-11. Geological Survey of New South Wales, Sydney, 509 pages. 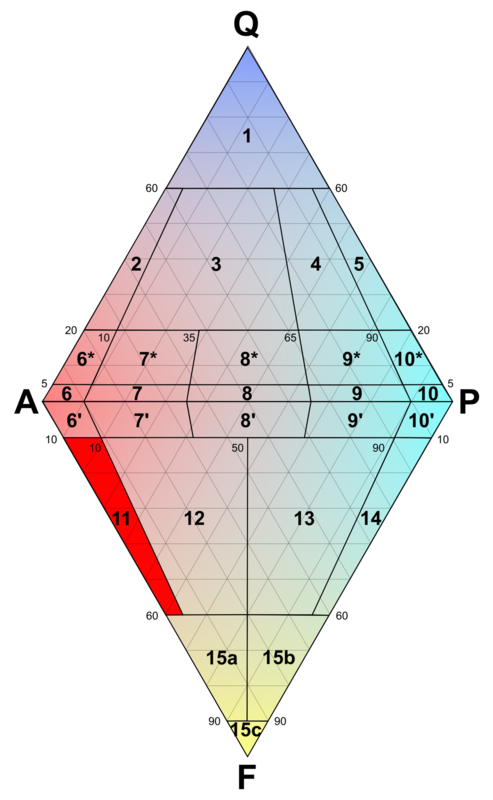 [Peralkaline phonolite] Wheeler, S., Spigarelli, S., Stoppa, F., & Rinaldi, R. (1996). 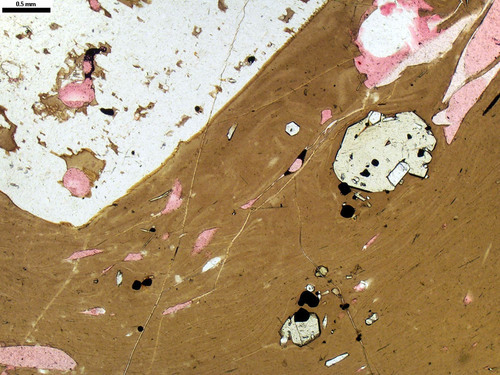 Secondary minerals from the igneous complex of Colle Fabbri, Spoleto (PG). Plinius, 16(2), 1. [Tinguaite] Solovova, I. P., Girnis, A. V., Ryabchikov, I. D., & Simakin, S. G. (2006, October). High-temperature carbonatite melt and its interrelations with alkaline magmas of the Dunkel’dyk complex, southeastern Pamirs. In Doklady earth sciences (Vol. 410, No. 1, pp. 1148-1151). MAIK Nauka/Interperiodica. U.S. Geological Survey, (2005) Mineral Resources Data System: U.S. Geological Survey, Reston, Virginia. McLemore, Virginia T. and James R. Guilinger (1993): Geology and mineral resources in the Cornudas Mountains, Otero County, New Mexico and Hudspeth County, Texas pp. 145-153 in Carlsbad Region (New Mexico and West Texas), Love, D. W.; Hawley, J. W.; Kues, B. S.; Austin, G. S.; Lucas, S. G.; [eds. ], New Mexico Geological Society 44th Annual Fall Field Conference Guidebook, 357 p.